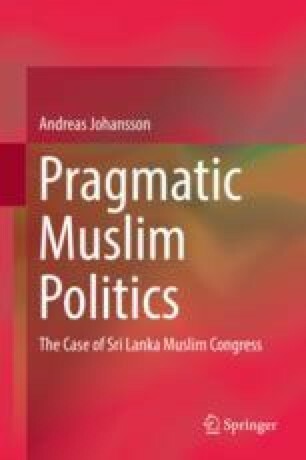 This chapter focuses on the current leader Rauff Hakeem’s speeches in parliament and elements of Muslim politics in them. As described above, the political conditions were different during the second half of the period that I am investigating in comparison to those that existed during Ashraff’s era. This was largely due to the fact that the civil war ended in 2009. Nevertheless, the war was ongoing during the first years of the Hakeem period, and it is also in regard to this topic that we find most of the references to Islam, or, rather, to Muslims. As will be shown, Muslim politics are in practice almost absent from speeches where other topics are addressed. BBC. 2012. White van ‘terrorises’ Jaffna. BBC Sinhala. Retrieved November 20, 2012 from http://www.bbc.co.uk/sinhala/news/story/2007/03/070323_jaffna_batticaloa.shtml. Eighteenth amendment to the constitution of Sri Lanka. Retrieved February 8, 2014., from http://www.priu.gov.lk/Cons/1978Constitution/18th%20Amendment%20Act(E).pdf. Jeyaraj, D.B.S. 2003. Oluvil Declaration Proclaims Advent of Muslim Thesam. Sunday Leader. Retrieved February 6, 2014 from: http://www.thesundayleader.lk/archive/20030209/issues.htm.